Actually looks fairly close to the "beauty shot" on the Burger King website. The Rodeo Crispy Chicken sandwich is about the size, in circumference, of one of BK's basic hamburgers. It's thicker, though, due to the onion rings. 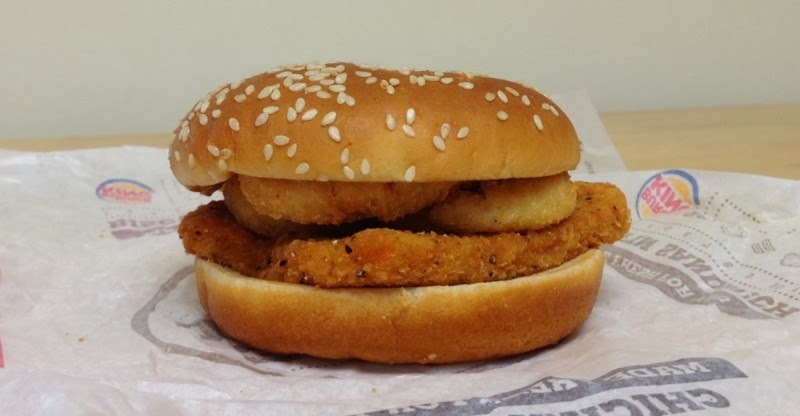 On their website, Burger King describes the Rodeo Crispy Chicken this way: "Our new Rodeo Chicken Sandwich features deliciously crisp chicken, sweet and spicy BBQ sauce and crispy onion rings served on a toasted sesame seed bun." As you can see, there are three small onion rings on top of a breaded chicken patty. There is barbecue sauce on both the top and bottom buns, but unlike in the BK.com website photos, the sauce is not oozing out. It was applied judiciously, rather than liberally, to our sandwich. So how does it taste? The chicken patty was on the bland end of the flavor scale. 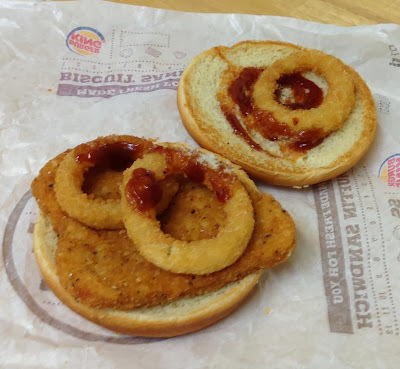 And although the patty and the onion rings are breaded, there wasn't a whole lot of crunch. It wasn't mushy or anything - there just wasn't the bite we were hoping for. Much of the flavor on our Rodeo Crispy Chicken came from the barbecue sauce, which had a very nice tang to it. 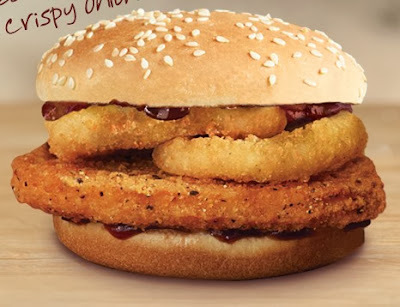 Combined with the onion rings, it added a nice amount of sweetness - not too much, but enough to notice in each bite that contained sauce. The Burger King Rodeo Crispy Chicken is not a great sandwich, but the barbecue sauce adds good flavor, and for only a buck it's a good value. We give it 3 out of 5 stars. Learn About Black Holes ... with Rap! Trailer for B.J. Novak's Book: Le Magnefique! Have You Tried a Hot Dr. Pepper?